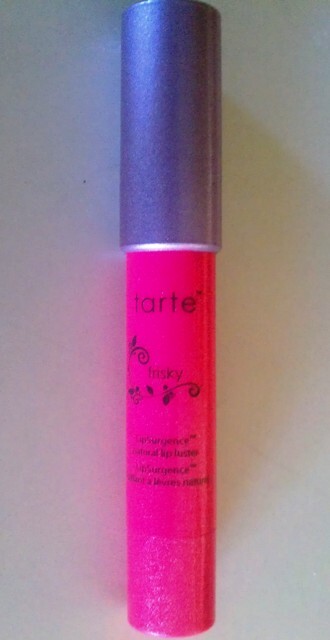 Tarte LipSurgence Natural Lip Luster in Frisky - looks scary, right? If I'm being completely honest, I tend to make snap judgements. Now, even if my gut instinct is right about things 9 times out of 10, I know that's a bad habit to have. I'm working on it. Really. Still, when I got my most recent Beauty Test Tube from QVC (if you're not familiar with it, it's essentially like Birch Box except it comes out about once every three months and contains more products, including at least one full size item) and pulled out the Tarte LipSurgence Natural Lip Luster in Frisky, I once again judged the proverbial book by its cover. I took one look at the shockingly hot pink color of the tube (not the product itself, mind you) and was ready to allocate it to "Pass onto someone else" pile of products. But really, could you blame me? The packaging of this thing is so damn bright, it's practically neon pink. As much as I like the look of bright lipstick shades on others, when I wear a lipstick or gloss that's too bright, I wind up looking like a clown because of my ultra fair skin. I guess morbid curiosity got the better of me, though, because I decided to give the thing a swatch. Now, I probably should have known better all along since I have a bunch of these Tarte Lip Surgence sticks and the luster finishes are all pretty sheer. Still, I was pleasantly surprised by the gorgeous, not-scary-at-all mid-tone shimmery pink that appeared when I swatched Frisky. I think it's a perfect bright lip color for summer without being too obnoxious - though if you have darker skin, it might not have quite the impact that it does on my ghostly pale skin. Don't assume that you can't or won't wear a color just because it looks scary in the tube/compact, etc. or its packaging is a little brighter than you're comfortable with. And even if the shade does turn out to be a little brighter or darker than you normally wear, there are always ways to get around that - layering it with another product, applying it differently, etc. It's good to keep an open mind. Do you make snap judgements about whether a makeup shade will work for you? Are you comfortable trying new things? What do you think of Frisky? Pretty, right? The product itself looks so much more wearable than the tube! It's gorgeous! gorgeous gorgeous gorgeous! I love this color pink. Should be amazing during the summmer.